A website theme is a key factor in determining the fate of your online business. If it is lightweight, SEO friendly and mobile optimized, you will get more visits from search engines and social sites. Whilst a highly customizable theme lets you design the blog as you want with full control over the management process. Premium WordPress themes come with the most advanced features and tools to create a user-friendly website and meet the expectations of the visitors. They are responsive and deliver the contents in the lightning speed across the devices. So people can access your pages without a waiting period which will help you to boost rankings and grow the traffic. There are several theme marketing places where you can buy high-quality themes at affordable rates. They sell thousands of themes which are suitable for any website type and you can filter the results by category, layout, features, price, and others. Normally a premium theme costs from $9 to $100. But you can buy them during shopping seasons like Black Friday with huge discounts and attractive deals. As a WordPress blogger, you will get unlimited themes from the digital markets in both free and premium tags. Ask other bloggers in your network about their favorite theme. Most of them will give you the same answer. It is the most popular framework for creating beautiful, powerful websites. It contains tons of controls to do unlimited things in the design and customize the blog to any extent. This StudioPress product has a clean look and lightweight design that will help you to boost traffic and reduce the bounce rate. Genesis’s search engine friendly features will add the benefits of ranking higher in the organic results and thereby improve the visibility of your contents. Genesis is built on HTML5 and it will make your blog responsive, mobile-optimized, and up to date with the modern designing trends. The security standards it adopts and regular updates will ensure that your site is highly secured and free from any vulnerabilities. Genesis framework and child themes will give exceptional value to your website design and deliver pages in microseconds. The theme options, layouts, custom widgets, and others allow you to build unlimited unique websites that match the requirements of your business. You can buy the Genesis framework alone for $59.95 or along with all child themes presently available and they going to make in future for $499.95. These are one-time payments and you can use them in unlimited websites. StudioPress will provide frequent unlimited updates to the products you purchased. Bloggers may not be able to invest such a huge amount in the beginning days. If that’s the reason why you stay away from Genesis, I will tell you a method to use both of them for free. Yes, you read it correctly. The Genesis framework and 35+ child themes are available for free and you can use them without making payments. As you know, a hosting plan is required to host any WordPress website. Unlike Google Blogger, you can’t host the blog in WordPress server freely. Dozens of hosting companies offer quality services to start and host websites or blogs on WordPress. The technology standards and performance of the hosting service you choose will influence the growth of your online business. If your website is slow and not available with 99.9% uptime, how can you improve the page views and promote the sales? WP Engine is the award-winning WordPress hosting company which is integrated with most advanced breed technologies and tools to bring your website beyond imagination. It delivers your pages faster and provides a user-friendly reading experience to the visitors. WP Engine’s regular security updates and powerful threat detection abilities will safeguard your business against cyber threats and security vulnerabilities. WP Engine has a simple, elegant interface to manage your website and other related products. Their in-depth insights on the performance of your pages are useful to optimize your digital experiences and thereby accelerate the business growth. All their plans come with CDN and SSL certificate that will again improve your site speed, traffic and security. You can easily create a commercial website or blog with WP Engine. Learn How to Create a WordPress Blog with WP Engine (Step by Step Tutorial). WP Engine is the reputed name in the WordPress hosting and a great place to start your website or blog irrespective of their types. They are experts in the field whom you can contact anytime in order to solve common queries or seek guidance on optimization methods to improve the website performance and supercharge the user-experience. 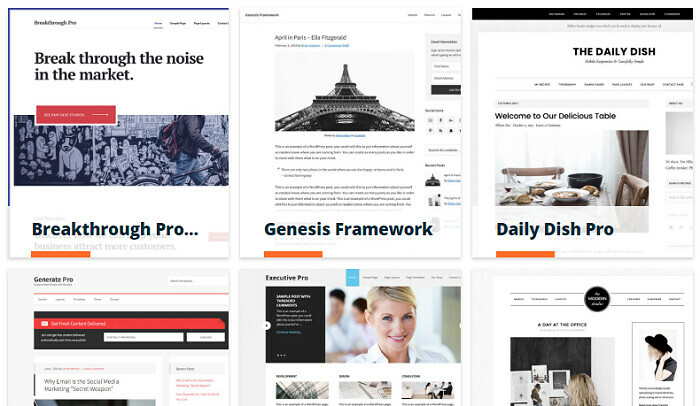 Genesis is a highly customizable, powerful framework to build a website that can bring more visitors to your contents and convert them to your regular readers or customers. It will display your contents beautifully and deliver them to the end user faster than you expected. Experience both of them with a single WP engine subscription. It means you need not pay anything extra for Genesis products and everything is included in the plan you chosen with WP Engine. They offer a money back guarantee of 60 days. So you can cancel the subscription anytime in this period and get back the amount paid.